Light gun = Pure fun. Sheesh it’s been such a very, very long time since I’ve played this game, but when I was younger we played this game out! (And also when I visit back home, we enjoy playing it all over again). Duck Hunt was originally released in October 1985 (I believe), published by Nintendo of America Inc for the good old, beloved NES. The game came with a "gun" or "zapper" that was, in a few words the most awesome thing that a child had ever seen ... at the time. The game plot simple - ducks fly, you shoot and try and bag them, however if you miss them your hunting dog will then laugh at you and make you feel more pathetic than co-starring in (yet another) volume of Home Alone with Macaulay Culkin. Thanks for the desire to shoot, puppy! It may sound cheesy but it’s anything but cheesy. This game was the game back then. 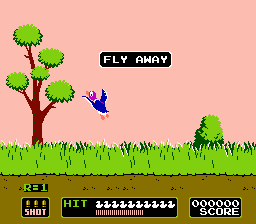 The bonus rounds were cool, this duck would fly by the screen (lol, fly by), and you have to shoot them quickly. I can’t and won’t say that you had to have mad skills to play this game, because it’s as easy as point and shoot. I wouldn't either go on to say "d00d buy this game" because I believe that quite simply you either lived through this game or you didn't, and if you did... You are among the truly blessed. Even though I can’t say for all it was the easiest – as I’m blind in my left eye I have no depth perception so I figure this made the game more of a challenge for me than for others, this also made it more enjoyable for when I actually hit the ducks! As for the graphics, while if we compare them to today’s standards clearly we are going to see a vast different in end results. But consider it in regards to when it was bought out and in regards to what we had available technology wise in ’85, for that reason I’d say the graphics were pretty good for its time and the type of game it is. So after all of my ranting I really couldn’t find much wrong with this game, it’s got everything I enjoy: puppies, guns, shooting and ducks... 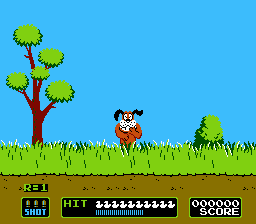 I figure I could have summed it up in one line: As far as Duck Hunt goes, the only major flaw in this game is without a doubt the dog. (Mind you, I think subconsciously the dog is what got me interested in target shooting today =P so for that I won’t hold too much of a grudge).